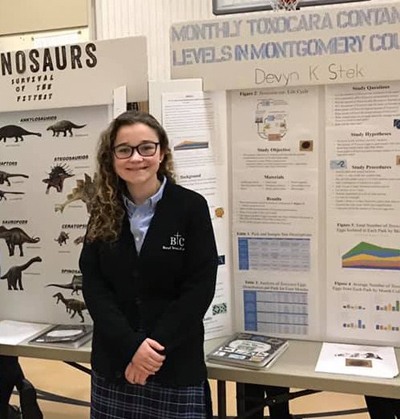 Devyn Stek, 13, of St. Teresa of Calcutta Education Center in Limerick, Montgomery County, proudly displays her science project which she presented at her school, the county and nationally at IDWeek, a prestigious gathering of medical-science professionals in October 2018 in San Francisco. Most students submit their science project in a grade-school or high-school competition, and the project goes no further. But Devyn Stek, a student at St. Teresa of Calcutta Education Center in Limerick, saw her project get to the county level and way beyond. At 13 years old, she became the youngest student ever to present at ID Week, a national gathering of medical-science professionals held in October 2018 in San Francisco. As part of her project investigating a parasitic worm that affects pets, Devyn traveled to parks throughout Montgomery County and collected soil samples. “You can study science wherever you are,” Devyn said. After the Stek family’s veterinarian first informed Devyn about the roundworm parasite when her family’s three stray cats were dewormed, she noticed very little research had been done on it in Pennsylvania. The parasite infects cats and dogs, and its transmission to people can cause eye, lung, heart and neurologic problems, according to the nonprofit Companion Animal Parasite Council. Devyn’s father Jon drove her to the parks but apart from that, she independently researched her topic, collecting her own samples, studying them under a microscope, analyzing her data and presenting her conclusions. At the ID Week convention of seasoned professionals no younger than university graduates, Devyn was by far the youngest presenter. She attracted much attention at the gathering, met with NASA astronaut Kate Rubins and interviewed with Medscape, a medical news website. “It was neat standing down at the end of the hall watching the parade of people come down (to see) this short, little girl,” Jon Stek said. And Devyn might become a repeat visitor. The St. Teresa student plans to expand her project by collecting more soil samples. Devyn’s father supported his daughter, realizing that entering Devyn’s submission to ID Week held no cost. “The worst that could possibly happen is they say no,” he said. ID Week said just the opposite, and when Devyn told her father about her acceptance, he was stunned. He even called an individual associated with the gathering and explained Devyn’s age gap, but the meeting’s organizers saw past Devyn’s young age. Science has always held a fascination for Devyn, which appears to run in her family. Jon is a medical writer for a large pharmaceutical company and his father was a science researcher. The two men inspired Devyn to follow the same path. Jon remembered how Devyn as a little girl studied animal names at the zoo. Her mother, Denise Stek, said Devyn always received good grades in math and science. Devyn received support from her science teacher at St. Teresa, David Dusza, and classmates. The teacher enjoyed seeing Devyn work on her project during class and eventually submit it to ID Week.